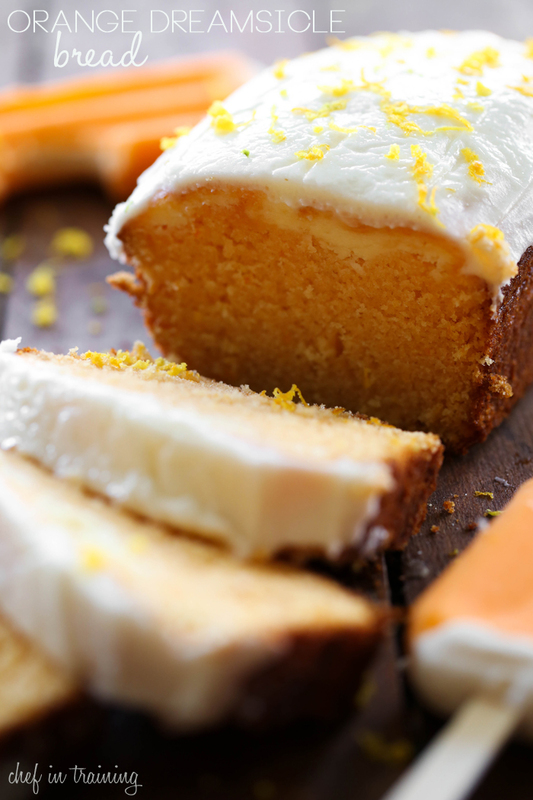 Calling all orange dreamsicle fans out there… this recipe is for you! Since creating this recipe, this bread has been made a handful of additional times since. This bread is heavenly! Delicious orange flavor paired with a cream cheese filling and creamy frosting- it is truly a must make recipe! Grease and flour 3 (8x4 inch) loaf pans. In a large mixing bowl, beat oil, eggs, milk, sugar, orange juice and orange extract until smooth. Add in flour, salt and baking powder and mix until well incorporated. Stir in orange food coloring a drop at a time until desired orange color is reached. You can omit the food coloring if you want to, it just makes the bread appear orange like traditional orange dreamsicles. In a medium bowl, beat cream cheese, sugar, eggs and flour. Fill loaf pans each with ⅙ of the batter. Spoon ⅓ of the cream cheese filling onto the top of each loaf pan. Swirl in cream cheese filling by cutting it in with a knife. Pour ⅓ of the remaining batter onto the tops of each loaf pan. Bake at 350 degrees F for 50 minutes or until toothpick comes out clean. Cream butter in a medium bowl. Add in powdered sugar, orange extract and heavy whipping cream. Beat until smooth. Frost the tops of each cooled loaf. This absolutely looks and sounds like a dream! Love orange cream anything! Pinning this and can't wait to make it! This would be awesome. A once-in-a-lifetime treat! "Because usually, if we are going to spend our efforts cooking or creating, it might as well be working towards a new recipe to put on the blog" <--- THAT IS sooo true! So the fact that you've remade it AND it seems like it makes a pretty hefty amount (3 loaves in each batch), that's bigtime. And I looove orange dreamsicle-inspired desserts. I have a shake and cookies, but no bread. This is perfect, NIkki! Pinned! Thought of adding pumpkin to this recipe? Would love to hear about the result! Thank you for the nice recipe. I love orange. wow this bread looks amazing! Plenty to share too if it makes 3 loaves. Yumm! What does it mean in step 7. "Fill loaf pans each with ⅙ of the batter." How much of the batter? I know you need some to pour on top. I'd really like to try this sometime. The recipe makes 3 loaves. You put 1/6 of the batter in each of the three pans, add the cream cheese filling to each of the three pans, and then top each pan with the remaining cake batter. Can you sub applesauce for the vegetable oil? Thanks! What would the measurements be for 1 loaf? I only have 1 pan but would love to try! 100% agree - I also only have one pan - some of stuff no problem to divide by 3 but when you get into 1/4 cups of stuff????? 1/4 cup is 4 tablespoons. Each tablespoon has 3 teaspoons. So 4 tablespoons is equal to 12 teaspoons. Divided by three you would need 4 teaspoons, or 1 tablespoon plus 1 teaspoon. Wondering if this could be made in a bundt pan? How would you adjust the cooking time?? I did mine in a bunch pan just added 7 to 10 minutes on baking time turned out great. Such a good recipe. I don't understand how the 2nd mix is added! I'd like to make it but gel me understand! It looks so moist and heavenly. I might try making it but switching it to lemon. Just 1 question please...If I can't get heavy wipping cream, what can I use instead? You could buy a can of coconut milk and scoop off the very top portion of the can when you open it ( don't shake the can) that is the coconut cream which is thick like whipping cream and can be substituted for cream in most recipes. I have never tried it on frosting though.If it is for the frosting you could also sub silken tofu and look up a frosting made with it. It takes on the flavour of whatever you put it into. Hope this helps. If anyone manages to concert this into gluten free (no almonds- allergic to nuts) please let me know! I'm sure it would work great with a cup for cup gluten-free flour blend. My favorite is Better Batter, but there are others you can buy in the supermarket. I add one tsp of coconut extract to the cream cheese frosting - it enhances the flavor of the cream cheese while 'not adding additional overtones of coconut' - I learned this tip from another site and it absolutely works! can self-rising be a substitute for plain? if so, what would be the amount? I'm baking these right now! I was reading the recipe on my phone, which didn't show where it said to put 1/6 of the batter in each pan, so I didn't have any leftover to put on top! Is it going to totally ruin my bread? This is in the oven right now!! I'm hoping it tastes as good as it smells because this would be a great treat for a Christmas bake swap!! Made this and it is absolutely delicious. I did not use the orange food coloring and did add grated orange peel to both the batter and the frosting. Baked it in four mini loaves. Thank you SO much for this wonderful recipe. I made this for Easter brunch.. it was excellent!! I made mine in 2 bigger loaf pans a few days ahead. (I think this is key for me,to make the orange extract flavor "settle down" a little) This was my first time working with orange extract, and i wasn't too excited about the flavor in my frosting at first. But after a day or 2, the flavor is not as strong and it was perfect. I made this mostly according to the recipe, except I also added some orange zest in the batter, as well as in the frosting, for an extra dimension of flavor. Also for the frosting I cut the sugar back by abt half a cup. It was sweet enough for me. The bread was moist and it was a hit with everyone. I definitely will be making this again! I did the recicpe.....just one comment the cream frosting 2 CUPS OF POWERED SUGAR was too much sugar for only 1/4 cup of butter and 1/2 cup of heavy whipping cream. Yvan butter be used instead of oil? I am going to try this. It looks yummy. Can almond extract be used in place of the orange extract? Tried it !! It was awesome !! A wonderful recipie !! Definitely a keeper!! Does this use 1/4 cup frozen concentrate orange juice before it's mixed up or mix up the orange juice with water and that's what you use? Taking this to a girls night out. Thank you! Why is there only a 2 1/2 star rating on this when so many comments are positive? Do you think I could make this gluten free? It sounds wonderful. I didn't find it had enough "orange" flavor. How much more extract should I add? I made this and it was delicious. I would like to bake it in a 9x5 pan...how can I adjust this recipe without having ingredients left over? I mafe it and its perfect so moist and orangy! Question : can I bake it the night before and frost it before serving? I am 75 years old and bake almost every day. I picked out this recipe on Pinterest to bake and give to neighbors and friends over the Christmas holidays. It received many compliments. It was also very pretty sliced and put on a decorative plate while hosting parties. The orange zested over the top of the frosting gave it a nice appeal. I froze many loaves (wrapped in Saran Wrap, foil, then put in zip locks), giving bread to postman, neighbors who would drop by, etc. this recipe is new favorite of mine. Just tried it today and they turned out fabulous. Blink and it's gone. Absolutely love it. Could you make it into a tube cake rather than loaves? Does this bread need to be refrigerated? Can you freeze this bread? 3 loaves is too much but it sounds so good!